Lotus Notes to Gmail contacts converter software can convert Lotus Notes contacts (that includes business, personal, briefcase information etc) to CSV files and them import into Google GMAIL. For converting Lotus Notes contacts to Gmail, software creates a new file CSV that consist fields in Columns and information in Row of Lotus Notes NSF contacts (address book). Export Lotus Notes contacts to Gmail contacts with its all fields (first name, last name, email address, home city, home state, mobile phone etc) or some selected fields of NSF contacts. Software create CSV file of NSF contacts, for converting Lotus Notes contacts to Gmail contacts user have to browse that CSV file in Google Account Contacts in my contacts folder. While importing the Lotus Notes contacts into Gmail contacts, software maintain the originality of data and contacts fields, no data will be misplace or changed while conversion. After loading the NSF contacts file, software start extracting or scanning the available contacts detail into file and display the status report regarding the scanning process. Are you a Lotus Notes user, needs to convert Lotus Notes contacts to Gmail contacts? Labs provide complete solutions of Lotus Notes Address Book conversion software. You can use Lotus Notes Contacts to Gmail contacts conversion utility and perform the Lotus Notes address book (names.nsf) conversion process. Able to Convert Lotus Notes address book (names.nsf) into CSV file. Easily import CSV (Comma Separated Values) files into GMAIL Account contacts. Software does not require any technical skills and maintenance. 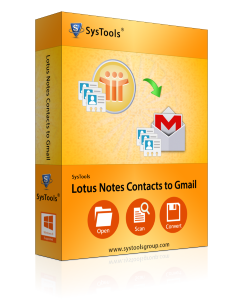 Demo version of Lotus Notes Contacts to Gmail contacts conversion software can convert only 10 contacts of Lotus Notes address book (names.nsf) files. Is Lotus Notes installation is necessary to use the software? Yes, Lotus Notes installation is required on machine for performing the conversion process of Lotus Notes contacts. I have several names.nsf file, can I convert all in one go? No, software convert one names.nsf having unlimited contacts to Google contacts at a time. Is it possible to import CSV file in Yahoo Contacts? Yes, Users can import CSV file in Yahoo contacts only with some alternative fields. Is there any specific Lotus Notes edition does software support? No, Software is capable to handle all Lotus Notes edition 6.0, 7.0, 8.5, & 9.0 for conversion. Lotus Notes Contacts to Gmail Converter is superb app for importing Lotus Notes names.nsf into gmail with same originality. All the fields and information remain unchanged after conversion. Keep it up guys!! While importing Lotus Notes names.nsf file into Gmail software saved my data into desirable location. I can manage all the data as per my choice and need in system and it's become easier for me to open Lotus Notes contacts. I want to say one word for this excellent Lotus Notes contacts migration tool. Within few seconds it converts my bulk NSF contacts into CSV file in their original format. Thanks for the co-operation of technical support.